Samarium cobalt magnet steel is widely used to manufacture a variety of magnet motors. There are many kinds of samarium cobalt motors. Samarium-cobalt permanent magnet AC motors include permanent magnet synchronous generators and so on. The use of these samarium-cobalt magnet motors can be seen from the capacity of the meter to several deciwatts and up to hundreds of kilowatts. Compared with non-permanent magnet motor, SmCo permanent magnet motor does not need excitation winding or exciter. It has the advantages of high specific power, small size and lightweight, power saving, copper saving, and other non-ferrous metals. 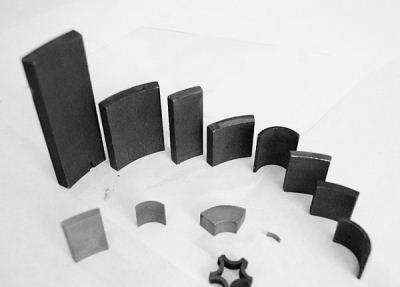 The emergence of the third generation of samarium cobalt magnets promotes the development of permanent magnet rotors. Permanent magnet intelligent motors have the advantages of saving resources, high efficiency, small size, and low noise. What is the difference between a motor made of samarium cobalt magnet and a motor made of neodymium iron boron? Because the magnetic energy density of samarium cobalt magnet is lower than that of NdFeB magnet, the air gap magnetic field intensity necessary for energy conversion is not as high as that of NdFeB magnet, so the capacity of manufacturing permanent magnet motor is smaller. After the advent of NdFeB permanent magnets, the situation has changed greatly. The magnetic field produced by high-performance NdFeB magnets can not only reach the magnetic field intensity produced by current excitation but also far exceed current excitation. Therefore, thousands of kW large and medium-sized motors can be manufactured. (1) The rare earth permanent magnet motor has no excitation coil and core, no loss, no heating and other characteristics to replace the common motor, which can reduce the volume, reduce weight and improve efficiency. If the permanent magnet motor is used instead of the traditional motor in automobiles, the volume can be reduced by 40%-70%, the efficiency can be increased by more than 50%, and the copper and electricity can be saved. It can save more than 90% electricity by replacing the electromagnets of electromagnetic switches and valves which are widely used in electrical equipment with permanent magnets. (2) Using the principle of magnetic levitation to make new friction-free bearings instead of traditional bearings, its energy consumption can be reduced by more than 90%. (3) Using magnetohydrodynamic power generation, when high-temperature and high-speed airflow passes through a strong magnetic field, the airflow becomes plasma conductive fluid to cut the magnetic force line due to high-temperature ionization and generates induced potential and energy.